After having suffered 10 miscarriages in 10 years, Sarah and Mark Brennan were ready to give up hope of having a child. 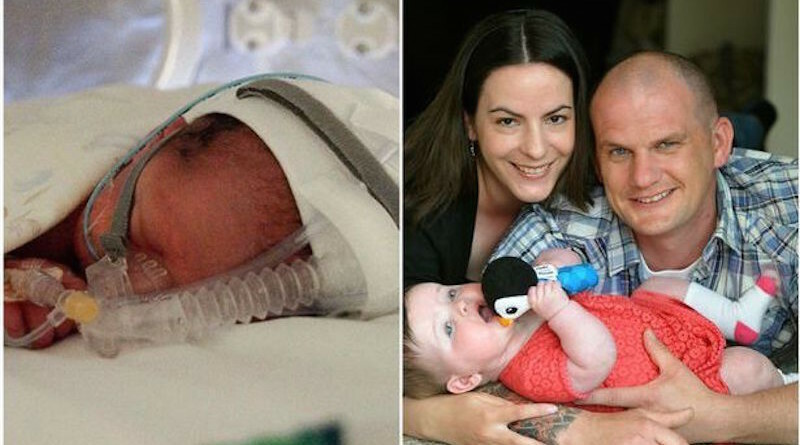 But then a miracle happened; after years of heartache and sorrow, their ‘miracle’ baby, Eryn, was born. The couple, from Swansea, UK, had resorted to IVF, but as soon as they were placed on the IVF waiting list, 36-year-old Sarah found our she was pregnant. Even though this was great news, Sarah and Mark still had a tough road ahead. At 29 weeks Sarah’s water broke, which was followed by a 2 week stay in the hospital where she was closely monitored and then sent home. Then, at 6 weeks premature, Sarah went in to labor. Eryn was born at 6lb 11oz, and was placed in the NICU. Sarah and Mark now faced another long and unpredictable wait before they could bring their baby home. “She spent the first three weeks of her life in the SCBU in Bridgend , with us travelling back and forth every day.” Sarah told WhalesOnline. Now one year old, Sarah and Mark are marking Eryn’s birthday with a beautiful gift; a donation to the unit that saved Eryn’s life to mark the milestone.